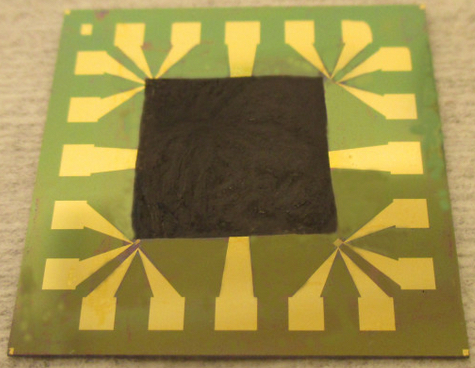 A method for efficiently cooling electronics using graphene-based film — with a thermal conductivity capacity four times higher than copper — has been developed by researchers at Chalmers University of Technology. The film can be attached to computer chips and other silicon-based electronic components. Electronic systems available today accumulate a great deal of heat, mostly due to the ever-increasing demand on functionality. Getting rid of excess heat in efficient ways is needed for chip lifespan and reduction in energy usage. A research team led by Johan Liu, a professor at Chalmers University of Technology, originally found that graphene can have a cooling effect on silicon-based electronics, but that it’s not efficient because it’s limited to a few layers of graphene atoms. “When you try to add more layers of graphene, the graphene will no longer adhere to the surface, since the adhesion is [due to] weak van der Waals bonds,” he said. The researchers solved that by creating strong covalent bonds between the graphene film and the surface. The stronger bonds result from adding (3-Aminopropyl) triethoxysilane (APTES) molecules to the film. Heating and hydrolysis then creates silane bonds between the graphene and the electronic component, doubling thermal conductivity. “Increased thermal capacity could lead to several new [cooling] applications for graphene,” says Liu, including LEDs, lasers, and radio frequency components. 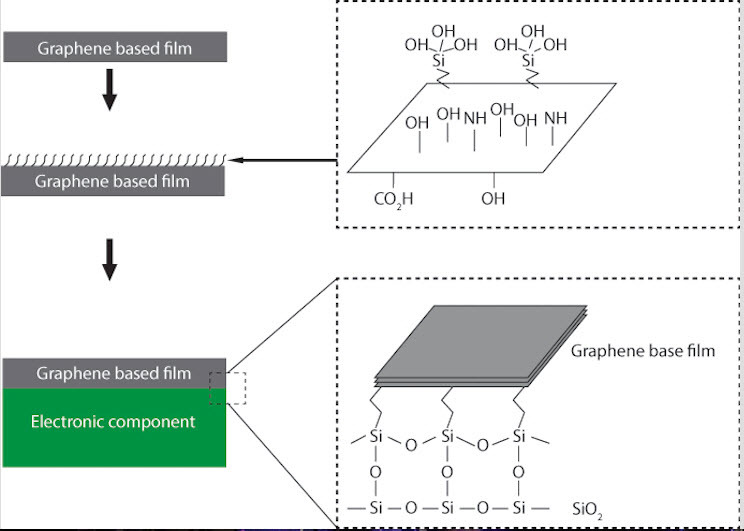 It is demonstrated that a graphene-based film (GBF) functionalized with silane molecules strongly enhances thermal performance. The resistance temperature detector results show that the inclusion of silane molecules doubles the heat spreading ability. Furthermore, molecular dynamics simulations show that the thermal conductivity (κ) of the GBF increased by 15%–56% with respect to the number density of molecules compared to that with the nonfunctionalized graphene substrate. This increase in κ is attributed to the enhanced in-plane heat conduction of the GBF, resulting from the simultaneous increase of the thermal resistance between the GBF and the functionalized substrate limiting cross-plane phonon scattering. Enhancement of the thermal performance by inserting silane-functionalized molecules is important for the development of next-generation electronic devices and proposed application of GBFs for thermal management.